Are you struggling to get a response to your prospecting e-mails? If so, you’re not alone. Sales reps across North America are frustrated with the lack of response when it comes to using e-mail to generate new business. Everyone agrees that the potential is tremendous but few have learned how to turn an e-mail into a sales opportunity. E-mail Prospecting Blunders Tele-seminar examines and dissects the common mistakes made by sales reps when using e-mail to prospect and sell products. It shows you what NOT do and then provides you with proven tips and techniques that help get your e-mail opened, read and acted upon. If you use e-mail or you want to use e-mail to prospect, then this tele-seminar is an absolute must. It is literally jam packed with practical but powerful tips, ideas, techniques, processes, strategies and tactics that can help you use e-mail to contact more prospects, speak to more contacts, generate more leads and sell more products and services. Don’t miss it. Do you have certain customers who consistently seem to frustrate, exasperate or stress you out? You’re not alone. Not by a long shot. In fact, studies reveal that one in six customers are considered difficult to deal with. Whether it’s a buyer who constantly chisels at price or a contact who continuously whines and moans about anything or everything, or the customer who gets you to do a lot of work but doesn’t buy, they tend to make your selling day that much more difficult, traumatic and time consuming. Selling to Difficult Customers is a workshop specifically designed to provide you with strategies and tactics to deal with those customers who make selling a chore rather than a profession. Based on the experiences of dozens of sales reps from dozens of companies, you’ll learn practical and easy to implement tips and techniques to tame and quell the toughest of customers. How to effectively manage and handle irate customers…and STILL sell them! When and how to FIRE your customers! Each difficult customer will be thoroughly described. You’ll learn precisely what to avoid when dealing with these clients and you’ll learn specific strategies and tactics that you can begin applying immediately. Bottom line? Easier, faster and hassle-free selling. Closing shouldn’t be this uncomfortable event for either salespeople or prospects. The close should be a natural progression to gain commitment for each step of the sales process. The problem is salespeople sell the exact opposite way their customers are buying. They position their offering for gain, opportunity, success and benefit; and their customers are buying for fear, loss, and insecurity. Needless to say, when salespeople go to ask for the sale the prospect isn’t ready to commit because they don’t feel their problems are clearly understood. Salespeople position their offerings logically and rationally and their customers are buying emotionally and intuitively. Salespeople spend all their time talking about the future and their customer's issues are all about the past. The information economy has changed the profession of sales forever. In bygone years a salesperson could define their value through the unique quality and differentiation of their offering. Today, with the abundance and ease of access to information, salespeople can no longer rely on their information to carry the day. The only remaining differentiator is through how they sell, not what they sell. Yet most salespeople look the same and act the same therefore further commoditizing themselves and their offering. Differentiate yourself through the quality of your engagement. Compel your customers to change. Create trust by being a neutral, unbiased and a balanced salesperson. Better understand and uncover your customer’s problems. Are you frustrated with the time and effort it takes to close a sale? Do you struggle with clients who seem to delay their decision to buy? 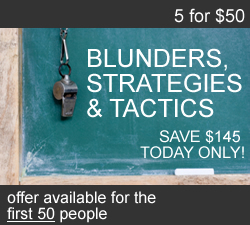 If this sounds familiar then Strategies to Advance the Sale and Reduce the Sales Cycle teleseminar is just for you. In this jam packed hour you will learn how to quickly and professionally move your clients through the sales cycle and get the dollars in the door (and in your pocket) faster. Developed from the combined wisdom and experiences of hundreds of sales reps this workshop is hard hitting and practical providing you with techniques and tactics you can employ immediately. If you’re annoyed with the fits and starts of a sales cycle this workshop will help you smooth the process, get your client focused, reduce the delays and help you meet and exceed your sales objectives. Don’t miss it! Is anything more important to the sales process than the close? It's the one skill that causes many of you to frequently ask for my help. Unfortunately most sales people have been taught closing techniques that are nothing more than manipulation skills. It is not uncommon to hear about the "assumptive" close, the "1-2-3" close or even the "puppy dog" close. These may sound interesting, but they are not effective for winning business in today's economy. After all, how do you feel when you sense that a sales person is trying to "close" you? What does it take to increase both your confidence and success at closing deals?